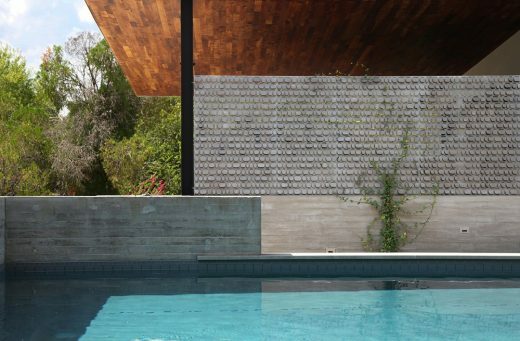 Casa de Sombra, named for an exploration of light and shadow, is a re-thinking of the suburban house that examines dichotomies between interior/exterior, public/private, and what it means to experience light and its absence. Built on a constrained site, the house opens to the south towards what would typically be defined as its ‘front yard.’ Through the handling of the house form and a series of outdoor rooms, the front yard becomes a pool court of exquisite privacy, light-filled and animated through the permeable skin of the rooms encircling it. A tectonic language that plays solidity and heaviness against lightness and transparency defines the dynamic of this dwelling. 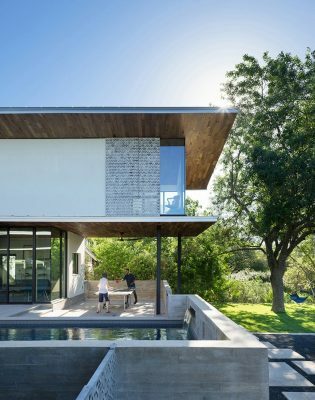 The design of the house in Rollingwood, Texas for a family of 7 was an opportunity to explore the integration of indoor and outdoor living. Situated on a limestone bluff within a suburban neighborhood, the house is organized around a central courtyard to provide an outdoor gathering space for the family and their many guests, taking advantage of the favorable climate for much of the year. Along the rear of the site, an electrical easement has protected a stand of Live Oak trees for over 40 years. In the front yard an ash tree provides welcome shade from the south. The bluff is 8 feet higher than the street, affording the house privacy and offering views over the neighboring houses to downtown Austin. Large windows and sliding doors connect the interior social spaces to the front courtyard and backyard. 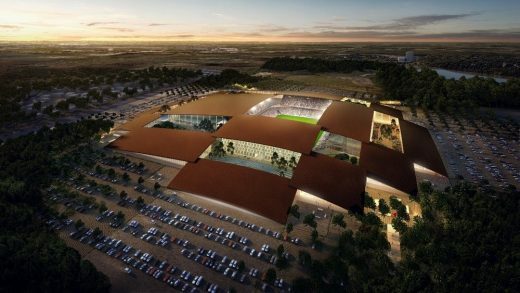 In order to maintain visual connections between inside and out while minimizing solar heat gain in the summer, computer modeling was used to design roof overhangs that protect the interiors from direct sun from April through October. 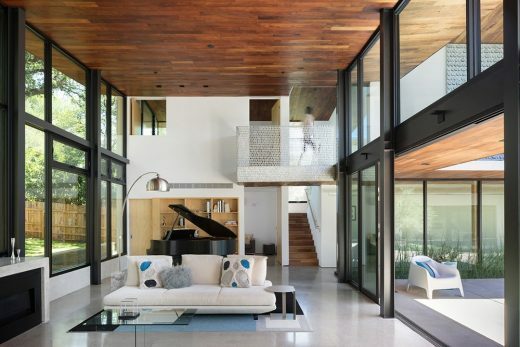 A double-height living room has two levels of roof to protect the interior from the southern sun. As an additional measure, movable shutters provide sun control while allowing in dappled light to animate the interiors. The shutters are formed from water-jet cut aluminum panels inspired by moon phase charts. The perforations are bent at random angles to form a light-reflecting louver at each opening. The shadows they cast create spaces that feel alive, and heighten one’s sense of the movement of the sun and the passing of the day. The perforated panel design is also used for a carport screen, courtyard gates, entry gate (in weathering steel) and custom exterior light fixtures. The outdoor use of the perforated panels creates conditions of dappled light on paving and wall surfaces similar to those of the interior. The house was designed to respond to the local climate and conforms to the latest LEED standards. 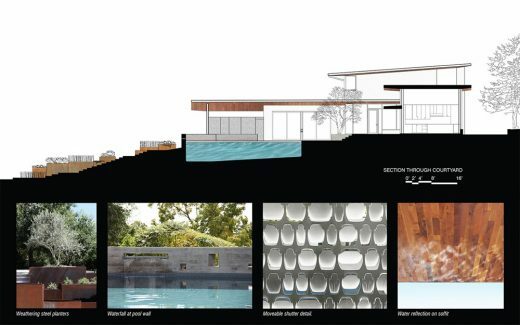 The sloping roof planes direct rainwater to an underground cistern used to irrigate the planted areas of the site, while terraced planters collect run-off for desert plantings. A zoned split HVAC system and extra insulation allow the house to outperform local energy code. Zero VOC products and low-flow plumbing fixtures add to its sustainable performance. The structure consists of wood framing augmented with exposed steel columns and concealed steel beams at cantilevered conditions. 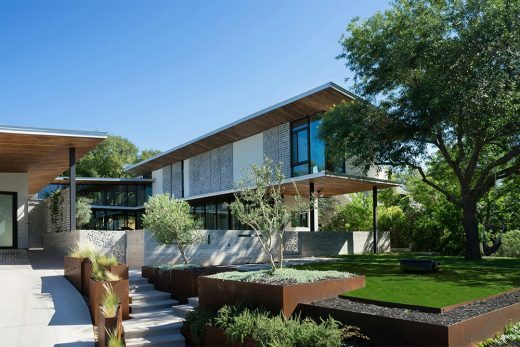 Natural materials used throughout the house were chosen for their sensory qualities; the warm red-brown of mesquite, the cool smoothness of ground concrete floors, the powdery quality of sanded aluminum, the raw solidity of board-form concrete and weathering steel. The materials create a palette that will patina over time and endure in a desert climate. General Contractor: Green Places, Inc.